What is this trace? I ask you. クリック ＯＫ！ → 極秘報告書「巨大隕石と大津波」　←リニューアル後の現在は?, 表示画面のBoon-Gateをクリックする⇒ジャンル・自然科学をクリックでＯＫ！です。^^! together with English. This English translation is Yahoo translation. Just now, I discovered secondary astrobleme of the iron pawn which collided in the western part of Gobi 65 million years ago. I call it an “Twin's lava meteorite” tentatively. The Antarctic Continent where I press-agent the first collision planet from 25 years ago is a huge meteorite of 65 million years ago. I announcing it the Antarctic Continent size meteorite as big game 1&2 of my blog. The trace of the 90% huge Tsunami which covered the surface of the earth of 65 million years while is long, I am amazed to know that stay in the desert. If the Tsunami trace is left for a long time; the; while was long, there should have been the fall of other meteorites by all means. 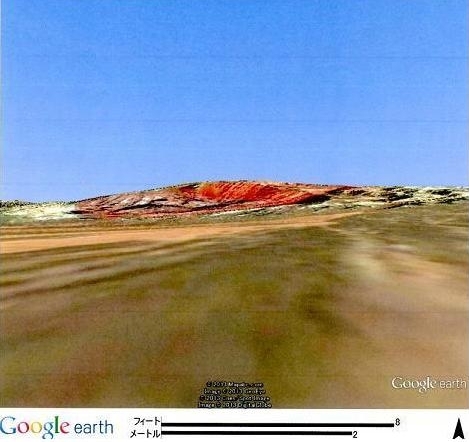 The secondary lava meteorite trace was caught in it when I looked for Gobi area using Google earth. It is the next photograph. 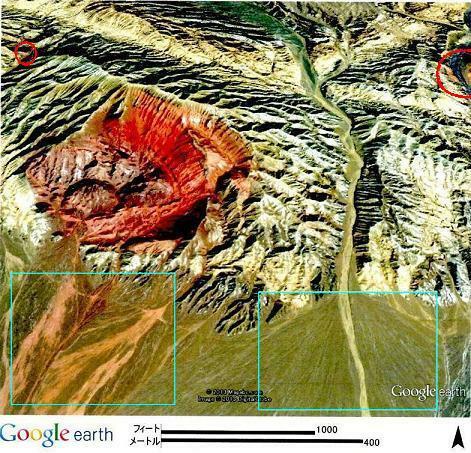 Position of the lava meteorite, There is it in the area of the Qinghai Gobi western part of China. The size, Two circles of approximately 100m overlap with the east and west. The depth, It is approximately 10m. At first, please search the position of this photograph in Google earth. And, please think about how this topography became. I want you to think by you oneself before I say a lack theory^^!. Somebody may have already found this twin 's lava astrobleme. However, as for this astrobleme, the huge planet which became the Antarctic Continent 65 million years ago collides, and what can conclude that it is a trace of the lava which splashed for second is important. I speak the six reasons. 1. As for the trace of the meteorite, the trace is carved with on the surface of the Tsunami trace 65 million years ago. 2. The shape can guess that two lava which collided towards the north from the south was piled up. 3. The trace of the collision is shallow with approximately 10m in a deep place. A meteorite can guess that it is a molten rock for the reason. 4. A color of the collision trace is the red that black was mixed in. I can guess that lava of the quality of iron became iron oxide from this color. 5. There is the countercurrent trace of the Tsunami in the south side of this collision trace. Its being red rust by the seawater of the Tsunami. 6. There is a trace of the red lava which splashed thirdly in two places of a northeastern direction in a photograph and the northwest direction. However, there is the big negation, too. The second. Why will there be the trace of the meteorite which splashed in the Northern Hemisphere not the Southern Hemisphere? However, by the reason of the negation, nobody can deny the existence that this astrobleme is set with the countercurrent trace of the tsunami. I am detective people mere amateur. I am not the police and prosecution engine. All of you reexamine my this unpolished report, and is not it a role of all of you who are an expert to form in form of the study? "Secret information" There is other meteorite information. I guide you. ^^? Postscript, If there is you who deny this report, I want to ask you. "On the Gobi what is the trace of this photograph if so?"